The Conservative Party are seeking to capitalise further on the BA strikes and Labour’s financial reliance on the union perpetrating the industrial action. 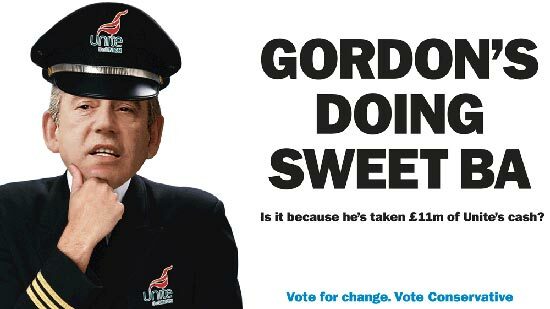 In their new poster Gordon Brown is depicted as the captain of Unite Airways in order to insinuate that his inability to end the travel chaos is linked to the fact that Labour is dependent on the union’s donations. The headline is very clever and the image of Gordon is suitably demeaning. Attacking Labour’s links with the unions always has been and always will be salient with the Conservative’s core vote. Making it a relatively light and accesible execution is intelligent as it will delight right wingers and amuse more moderate members of the electorate. If they had opted for a hard-hitting, aggressive line it could have been a set back to Cameron’s drive to win working class support which the Tories will need a great deal of in order to achieve a majority at the next election.